Shortly after the UN Security Council-imposed no-fly zone over Libya was to take effect, Colonel Muammar Al Gaddafi's government said it would halt its hostilities in the country. 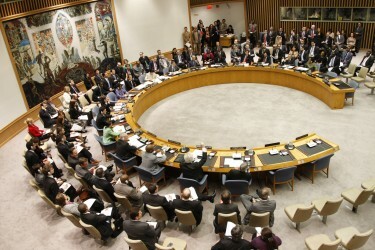 In a vote of 10 in favor and five abstentions, the United Nations Security Council passed resolution 1973, “all necessary measures” to protect civilians from pro-Gaddafi forces and to find a peaceful solution to the fighting that began when government forces began attacking anti-regime protesters. 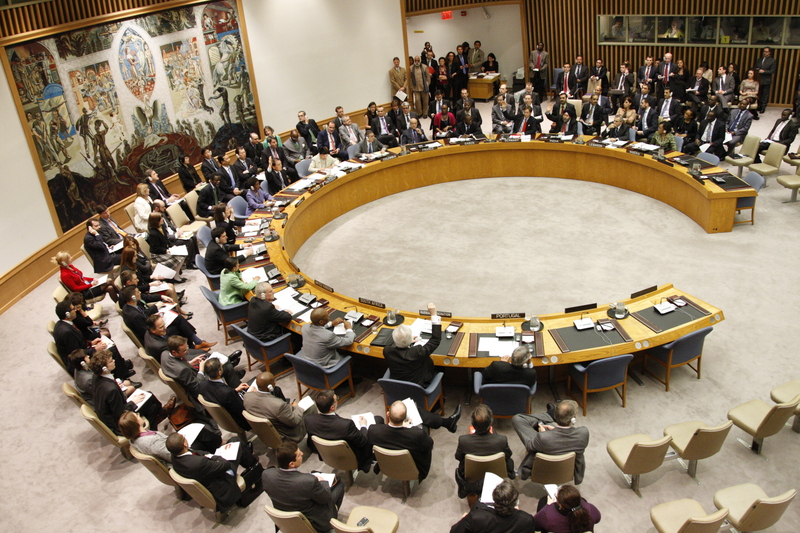 A wide view of the Security Council as 5 Members—China, Brazil, Germany, India and the Russian Federation—indicate their abstentions on resolution 1973 (2011) which authorizes the use of military force, including a no-fly zone, in Libya. Photo from the UN. First, we have Tweeps covering the press conference with Foreign Minister Moussa Koussa, who presented the Gaddafi government's first formal reaction to the resolution. @deepak_minhas: #libya's FM Koussa said bc his country was a member of the United Nations it is “obliged to accept to #UN Security Council's resolutions”. @freedom4libya: #Gadhafi announcing ceasefire. His deathsquads everywhere not covered by ceasefire. #LibyanTNC please be aware of his games. #Libya united. @evanchill: Regime ceasefire calculation? Continued assault = assured destruction. Cease fire = survival + control of capital and major oil facilities. Warning: Graphic Content. Here is a video, uploaded by marco1702 last week, showing fighting in Misurata. Tweeps also report fighting in other parts of the country. @freedom4libya: City of #Zintan is under attack. Let's step back a minute a cover some of the debate on the no-fly zone. Some say it is too little too late. @LibyaNewMedia: Only see reports of new meetings, new discussions while nobody listens to the Libyan people. Kinda foresaw this yesterday. No trust & hope. To counter the perception that a no-fly zone won't change military realities on the ground, reports have surfaced that anti-Gaddafi forces are now publicly receiving weapons from abroad. United nationd took to much time to take action twards no fly zone. My heart with those brave men who are leading an unequal battle against this insane. I think they should be concentrated more on forcing Kadhafi to step down rather than making statements about bringing stability to the country. The removal of the Libyan president is the first step to achieve this goal. UK, USA, France and Canada attacked Libya to protect innocent Civilians from Qaddafi’s forces, why not they are protecting innocent Pakistani civilians killing everyday by drone attacked of USA, do they think there are no innocent civilians being killed by USA drone Attacks on Pakistan?